Professor Igor A. Shiklomanov was born in Tver Region, Russia, on February 28, 1939, studied at Leningrad Hydrometeorological Institute, graduated in 1961 as an Engineering Hydrologist and got Doctor of Geographical Sciences on Hydrology and Water Resources at the same institute in 1977. He became a professor of this famous Institute in 1985 and the Corresponding Member of the Russian Academy of Natural Sciences on Hydrology and Water Resources in 1991. He has been the Director of the Institute since 1981, preceded by Deputy Director for Science from 1972-81. Developing the methods, assessing and forecasting human impacts on river runoff and water resources; studying changes in river water inflow and scientific generalisation of measures for solving water problems. Hydrological generalisation river and water-body hydrology and water resource re-distribution. Dynamics, forecasting and management of water resources, water use, and water availability regionally and globally. Hydrological and ecological studies of water systems. Detailed studies of anthropogenic global climate change effects on hydrology, water resources, and water management problems and developing the necessary adaptation measures. Thus his expertise are most appreciated by the current needs of global assessment of water resources, its availability, needs, development, problems, changes, estimates etc. Indeed he has been serving as the major scientist for collecting and analyzing global water resources data. His first contribution on this subject was an article: Kalinin G.P. and Shiklomanov I.A., Exploitation of the Earth’s water resources, published in the epoch making UNESCO IHP publication "World Water Balance and Water Resources of the Earth" in 1974 which has still been the only reliable world wide assessment of earth freshwater resources. His recent contributions on freshwater assessment were again conducted under IHP-IV program in 1990-96 and produced reports on "Assessment of the Impact of Climate Variability and Change on Hydrological Characteristics" and "World Water Resources at the Beginning of the 21st Century". They are the most important scientific fact documents serving as the bases of the current water policy planning in the UN agencies and many NGO’s including World Water Vision of WWC. The final publication based on those reports is in press from Cambridge University Press as a book "World Water Resources at the Beginning of the 21st Century" English edited by John Rodda. Professor Shiklomanov served and has been serving as a member or chair of a numerous number of committees, boards, councils etc. He has been the Deputy Chairman of Russian National Committee for UNESCO IHP since 1990 and served as the Chairman of the Intergovernmental Council for IHP for 1992-94. He has been serving as a key Member of Steering Scientific Committee for GEWEX WCRP since 1992 and was a Lead Author of IPCC WG2 Third Assessment Report 1998-2000. He is now the Chairman of Working Group on Water Resources Commission for Hydrology WMO since 2000 and above all, the Vice-President of International Commission on Surface Water of IAHS since 1999. His scientific contribution to scientific community as well as the people of the world is tremendous and deserves to be the first winner of the International Hydrology Prize of the Century. I am very grateful to IAHS, UNESCO, WMO, for the high honor of the International Hydrological Price, and I am very much obliged to my friends and colleagues for my nomination and selection. Hydrology is my science. I devoted 45 years of my life to it and for the last 20 years I have been director of the St. Petersburg State Hydrological Institute – the oldest, leading institute in Russia in the field of hydrology. Our institute will be 82 years old this year. Every day I came across various aspects f modern hydrology and water resources. Quite often our science is though to be in crisis. If you ask my opinion I would frankly say no: there is no crisis in hydrological science. Hydrology came into existence to answer practical needs and in the twentieth century it progressed both dynamically and comprehensively: hydrological network, theory, field, and laboratory experiments, remote sensing methods, mathematical modeling, and computerization, GIS-technologies were developed. Hydrology and water resources became more and more closely linked with ecology, economics, and social sciences. To the large extent development of hydrology in the last 40 years was promoted by international cooperation. However the whole experience accumulated in the past century needs to be critically analyzed and harmonized. It is quite possible that in certain periods the role of several fields of hydrological science and practices was significantly overplayed at the expense of the others. This is only natural. For instance, heavy inclination toward mathematical modeling and computerization did not complemented but was rather done at the expense of the process-oriented studies that involve tedious field and laboratory investigations. Such inclination quite often becomes a "fashion" and negatively affects the development of fundamental basis of hydrological science and its applied and environmental-protection aspects. For example, college graduate who comes to hydrology usually has good computer skills and has general ideas about hydrological processes. Computer can be loaded with software for any hydrological tasks. Just enter the necessary data, press the buttons and you will have quick results. This creates an illusion that all hydrological problems are solved. If this is the case, why to get engaged into high-cost experiments, which require significant efforts, time, knowledge, and hard work? Maybe this is one of the reasons (and not just finances) of insufficient attention to observations and experimental aspects of hydrology we witness in recent years? Maybe we really know everything about hydrological processes, can compute everything, and will be able to model everything? If we, hydrologists as scientists will think like that, then we can say with certainty: " hydrological science is in crisis." I do not think so. No secret, many models are based on the most elementary algorithms, very rough approximations that are far from adequate representations of hydrological processes. This is primarily so because there are many things that we don’t yet know, or better to say, we know more than we can explain. I am sure we must pay more attention to the development of experimental hydrology; and first of all, it should be done through IAHS as an authoritative, non-governmental organization, not burdened with official projects of governmental organizations such as UNESCO, WMO, UNEP and so on. In the last ten years the problem of anthropogenic climate change, global warming, and the studies of possible consequences, including those related to water resources became very popular in natural sciences and in hydrology in particular. This problem is often subject of scientific discussions that result in different opinions. Some scientists believe that temperature rise has nothing to do with increase in CO2 concentration, considering it as a pure manifestation of natural cyclic fluctuation of the climate. To their mind future cooling is inevitable. Some believe that actually there is no CO2 increase or warming, and numbers usually presented to illustrate the problem reflects shortcomings of our non- representative observational network or inaccuracies in estimation methods we use, when it is possible to obtain any results if needed. The problem of forecasting of intense global warming has many uncertainties. Quite possible this hypothesis will not be confirmed in the future. But even if this is the case the hypothesis of global warming is very useful and, in my mind it contributes a lot to the development of science. It unites scientists of different discipline- climatogists, hydrologists, oceanographers, economists and others, which is very important and useful for all. It stimulates the development of our sciences, and finally it compels governments to allocate more money to our investigations. I believe that problem of global warming is one of the positive factors for the development of the modern hydrology. 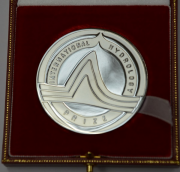 My whole live is closely related to the State Hydrological Institute, and the Prize I was awarded is, first of all, a high recognition of the institute’s work, and its considerable contribution to international cooperation. My home country- Russia possesses 10% of world renewable water resources, and we fully recognize our responsibility of their studies and rational use on the whole large territory of our country. Experience, accumulated in Russian hydrological investigations and generalization over vast territory and very sparse hydrological network has become very useful for problems related to assessment of the world water resources. We have been studying this problem for more that 30 years, and the role of the international cooperation is very important. In fact, it would not be possible to do something important and useful related to this problem without help and support from such international organizations as UNESCO, WMO, IAHS, and all our foreign colleagues. I would like to express my sincere gratitude to them all. The state of the world water resources, deficit of clean fresh water in many regions of the world, water conflicts between different countries, forthcoming water crisis- those are our common problems, our concerns, and responsibilities. Those problems are important for both: our and future generations. They can be solved only if there is general understanding of how exclusive and unique fresh water is for live and well-being of humanity, and how sensitive it is to unwise and harmful activities. This understanding should be based on fundamental knowledge in the field of hydrology and water recourses. During IAHS Assembly we will discuss the development of hydrology within the framework of IAHS, and, in particular, initiative and suggestion made by Prof. Kuniyashi Takeuchi, the IAHS president to organize the long-term program "IAHS Decade on Ungaged Basins". I absolutely and enthusiastically support this brilliant suggestion. It is especially useful under current reduction of the world hydrological network. I would like to emphasize that solution of this challenging problem has not only great practical but also scientific importance. To my mind, we can believe that we have studied successfully the hydrological processes and phenomenon very well only when we are able solve various hydrological problems for ungaged water basins, i.e. the problem should be a first priority to IAHS. I am happy that I work in such interesting and important field of science as hydrology. I have been lucky to participate in the international scientific cooperation, and communicate closely with you- my friends and colleagues, and I deeply appreciate such a high recognition of my modest contribution to hydrology and water resources.